In two seasons under Head Coach Chuck Knox, the Seattle Seahawks had made it into the playoffs for the first time in the young club’s history. They had put together a 12-4 record in 1984, which was all the remarkable since they lost star RB Curt Warner to a season-ending injury in the opening week. Unheralded QB Dave Krieg (pictured at right) developed into a star in his first full year as the starter and had Pro Bowl WR Steve Largent to pass to while the defense was opportunistic, leading the league in interceptions and fumble recoveries. For the ’85 season, they had Warner back in the lineup and won their opening game against Cincinnati. For Week 2 on September 15, 1985 the Seahawks traveled to San Diego to take on the Chargers. The Chargers, under Head Coach Don Coryell, were coming off a disappointing 7-9 record in ’84. However, they still had a potent passing offense directed by QB Dan Fouts and including wide receivers Charlie Joiner and Wes Chandler, plus all-purpose RB/WR Lionel James. They were still without star TE Kellen Winslow, who had suffered a major knee injury in 1984 (he would return at midseason), and the defense was suspect, but San Diego could not be taken lightly and had won its opening game as well. It was a clear day at San Diego Jack Murphy Stadium with 54,420 in attendance. Midway through the first quarter, the Chargers erupted with a 64-yard scoring drive in four plays. Fouts threw completions on every down, including 25 yards to Chandler and 19 yards to Lionel James, who then hauled in a seven-yard touchdown pass. Following a three-and-out possession by the Seahawks, San Diego put together another series that put points on the board. Fouts again had a hot hand as he completed his first five passes, with Chandler pulling in three of them for 48 yards. But after getting to the Seattle four yard line, the drive stalled and Bob Thomas kicked a 21-yard field goal to make it 10-0. Before the opening period was over, the Seahawks finally put together a scoring drive of six plays that covered 74 yards. Dave Krieg was successful on four passes, the last a 34-yard completion to WR Daryl Turner for a touchdown. 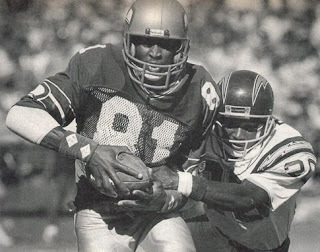 After the Chargers punted early in the second quarter, Seattle, with good field position, scored quickly thanks to three straight carries by Curt Warner (pictured at left), the last for three yards and the go-ahead TD. With the successful extra point, it was 14-10 in favor of the Seahawks. The teams traded punts before San Diego came back with an 11-play, 80-yard drive. Fouts completed a pass to James for a 22-yard gain in a third-and-22 situation along the way and the series ended with an 18-yard touchdown pass to Charlie Joiner. NT Joe Nash blocked the extra point try, but the Chargers were back in front at 16-14. The Seahawks moved back into San Diego territory on their next series when Krieg connected with Steve Largent for a 40-yard gain, but they were forced to punt three plays later when Krieg was sacked for an 11-yard loss on third down. The Chargers took just four plays to respond with another 80-yard possession that included James running for 17 yards on an end-around play, Fouts throwing to TE Eric Sievers for 29 yards, and Fouts then completing a 20-yard TD throw to Chandler. That was it for the first half scoring – San Diego had one last shot after a short Seattle series, but a 53-yard field goal attempt by Thomas on the final play before halftime was blocked following a bad snap. Down 23-14, the Seahawks started off the third quarter with a 75-yard drive in 11 plays, ending with Largent catching a pass from Krieg for a six-yard touchdown. San Diego came right back as Fouts threw to Chandler for a 45-yard gain and, two plays later, to Sievers for 23 yards. He passed again to Sievers for a five-yard touchdown. Thomas missed the extra point attempt, but the Chargers were up by 29-21. Seattle responded with another scoring drive, this time going 78 yards in six plays. Krieg threw to Largent for 17 yards and WR Byron Franklin for 28 before he connected with Turner for a 15-yard touchdown. With a successful PAT, San Diego’s lead was narrowed to one point at 29-28. The Chargers were forced to punt on their next possession and the Seahawks scored more points. It took them five plays to cover 80 yards with Warner gaining 21 yards on a third-and-one carry and Krieg throwing to Largent for 20 yards and Turner once again for 30 yards and a touchdown. With the successful extra point, the Seahawks were ahead by the score of 35-29. Things got worse for San Diego when safety John Harris intercepted a tipped Fouts pass. Helped along by a pass interference penalty, the Seahawks scored in five plays. Warner ran in from a yard out for the TD and it was 42-29 heading into the final period. Seattle had taken control of the game by putting 28 points on the board in the eventful third quarter. The fourth quarter started off with another turnover by the Chargers as Fouts fumbled while being sacked by DE Jacob Green and LB Greg Gaines recovered. Warner ran the ball three straight times for 35 yards and Krieg threw once more to Turner for a seven-yard touchdown. That, for all intents, finished off the Chargers. They scored a touchdown on a pass from backup QB Mark Herrmann to Charlie Joiner from a yard out and just 15 seconds remaining. Seattle, thanks to its second half barrage, won by a score of 49-35. San Diego outgained the Seahawks (557 yards to 489) and had the edge in first downs (32 to 30). However, the Chargers also turned the ball over four times, while Seattle suffered no turnovers. Dave Krieg completed 22 of 32 passes for 307 yards and five touchdowns with none intercepted – in the big third quarter alone, he was 12 of 14 for 192 yards. 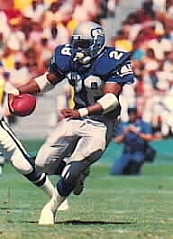 Daryl Turner (pictured below) was the receiving star with 7 catches for 121 yards and four of the TDs while Steve Largent contributed 6 receptions for 99 yards and a touchdown. Curt Warner also had a noteworthy day, rushing for 169 yards and two TDs on 28 carries and pulling in 5 passes for another 34 yards. For the Chargers, a great day by Dan Fouts went for naught as he was successful on 29 of 43 throws for 440 yards and four touchdowns with one intercepted. Wes Chandler accounted for 243 of those yards on 13 catches that included a TD. Lionel James led the club in rushing with 41 yards on 8 carries, caught 6 passes for 96 yards and a TD, and added 153 combined kick return yards to end up with 290 all-purpose yards. Despite the promising beginning, the Seahawks lost their next two games, and that was precisely the pattern they followed for the remainder of their disappointing 8-8 season – the same record that San Diego finished with. 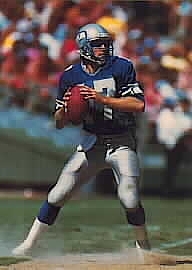 Dave Krieg passed for 3602 yards with 27 touchdown passes. Both he and Dan Fouts, who missed two games due to injury but still threw for 3638 yards, tossed 27 TD passes and 20 interceptions and, tellingly, were each sacked 52 times, which ranked third in the league. Steve Largent had another Pro Bowl season (his fifth) with 79 catches for 1287 yards (16.3 avg.) and six touchdowns. Daryl Turner caught 34 passes for 670 yards (19.7 avg.) and remained a potent scoring threat, tallying 13 TDs. Curt Warner made a successful comeback as he rushed for 1094 yards and caught 47 passes for 307 more. Wes Chandler was a Pro Bowl selection (for the fourth time) after catching 67 passes for 1199 yards (17.9 avg.) and 10 touchdowns. Lionel James continued to have big overall yardage totals as he set a new NFL record with 2535 all-purpose yards (516 rushing, 1027 receiving, 213 returning punts, 779 returning kickoffs).